The owners of upscale apartment community, the Marke, recently wanted to create a one-of-a-kind outdoor rooftop experience for their residents. 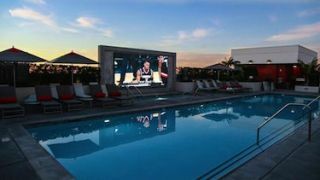 Working with Nashville-based PixelFLEX, they created an extravagant outdoor LED video display that is now the focal point for the luxurious rooftop pool and patio. Centered above the spa tub, PixelFLEX installed a custom 17’ wide x 8.5’ tall LED wall using its IP65 rated FLEXStorm SMD LED display with a 8mm pitch. With front-serviceable LED modules, the FLEXStorm is a custom LED video solution that can be mounted directly to any permanent surface. To control the FLEXStorm LED wall, PixelFLEX next chose to use its proprietary SU-PRO master control unit. Powered by NovaStar, the SU-PRO is an independent master control with switching and auto-scaling capabilities. Input sources for the SU-PRO include CVBS, VGA, SDI, DVI, HDMI and DP, plus it offers DMX512 and GenLock interfaces with fiber output and internet control capabilities as well.